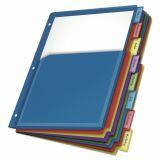 Cardinal Poly Expanding Pocket Index Dividers, 8-Tab, Multi-color Tab, Letter, 1 Set - Extra-tough translucent poly dividers with large insertable tabs offer a nonstick transfer-safe way for all documents and photos. 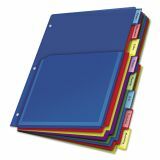 Tabs are designed so paper inserts won't fall out. Ample room for title on each tab. Each divider expands to hold 100 sheets. Multicolor.